Shelf Inflicted: My Dog: The Paradox. I discovered The Oatmeal during a charity campaign that resulted from creator Matthew Inman’s internet kerfluffle about an online news aggregator site using his material. After Inman complained, the site owner sent him a letter alleging defamation and demanding $20,000. Inman responded in typical mocking fashion, along with starting a donation campaign on Indiegogo for American Cancer Society and National Wildlife Federation. I started following him out of admiration for someone that had a just concern and took it a step higher. (Although this has nothing to do with the book, Goodreads, it does show that behavior can influence positively and negatively). When he first posted My Dog: The Paradox, I laughed so hard I cried. Seriously. There’s something perfectly twisted about his description of dogs, their bravery, their fears, their obsessions and their devotions. Part of the endearment is the drawing style, a MS Paint basic shapes in which the dog mostly resembles a snack-size Snickers bar. Recently Inman posted a picture of his drawing style through the years, and his earliest one was photograph quality. You wouldn’t know it by looking at the site, but he’s actually artistically talented. Of course, it also takes talent to use bug eyes to convey expression, but it’s a different kind. The book version of My Dog is nicely colored, substituting color for his finely shaded webcomic greyscale. He first published it in a poster, but when the book version came out, I had to have it. Inman is a little vulgar, but I confess I find it adds to the humor. Take the “My dog has absolutely zero interest in being clean” page, of a little dog rolling in fresh horse poop. It’s facing page? “unless it concerns his testicles.” Not only true, but hysterical in the cartoon, which is a chalkboard written by his dog that includes “Today’s Agenda: 11 am lick balls. get them sooper clean. 12pm lick balls. even moar clean.” Then there’s the chain cartoon of the process of a dog eating poop, vomiting, eating it it again, then pooping it out. If you don’t believe this actually happens, check a pet store for all the products that are supposed to make poop taste bad. Gross? Absolutely. True? Totally. Then there’s the list of things his dog eats that includes pencils and bees, coupled with a cartoon of a puzzled dog staring at a plate of broccoli. If you have a dog, you know this experience. For instance, my Labrador has to take pills every morning. She won’t touch them unless they are concealed in cheese or peanut butter. But the one time I dropped an ibuprofen by her? Gone in 5 seconds (and it required following it with an emetic, since ibuprofen is toxic to dogs). After making you laugh so hard your muscles hurt, he goes for the gooey center, the enthusiasm dogs have for their human owners, whether we’re gone for 4 hours or 4 minutes, and the sadness we have that their lives are so short. 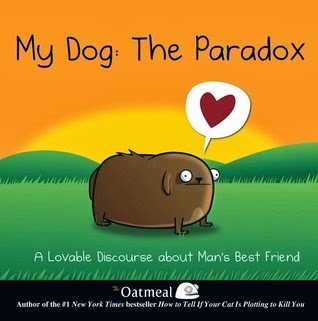 Read it online here: My Dog: The Paradox. But I highly suggest supporting his work in some monetary fashion, because not only is he funny, he’s willing to be emotionally and ethically brave.